Those moments when making a critical choice will determine whether you survive and thrive or not. For you, it might be a natural disaster like a hurricane, tornado or wildfire that rips through your town destroying everything in its path . Think it couldn’t happen to you? In the past 20 years alone, the lives of more than 200 million Americans lives were changed forever by natural disasters. A cyber terrorist attack that takes down our poorly protected electrical grid, reverting life back to the horse and buggy era. North Korea has already threatened to use a weaponized EMP against its enemies…And deadly radiation from a solar flare could reach our atmosphere any time. If it fries the electrical grid, everything will stop. EVERYTHING. No clean, running water, no heat, no lights or refrigeration, no way to communicate, no modern conveniences whatsoever – possibly for months. NO ONE will be coming to save you. That will be YOUR defining moment. I’m not trying to frighten you. I’m here to wake you up and inspire you! And, in a minute, I’m going to tell you how to be prepared to not only survive a natural or manmade disaster but thrive! When Hurricane Katrina tore through the Louisiana neighborhood of Buras-Triumph at 6:45 PM local time, on August 29, 2005, we lost everything. The content of our lives was swept away in a 22-foot storm surge, leaving us in shock and disbelief. I had no clue what to do, no plan in place, no resources at all. And when my daughter looked up at me terrified, helpless, I was crushed. It was a painful moment – One I will never forget. You can not only survive a disaster but thrive in the aftermath. The trouble is, we live in an age where volumes of information are freely available and yet most people are clueless about what to do. I don’t blame them really. Not so long ago I was one of those people too. And, spend thousands of dollars buying gear that may or may not work. One thing is for certain: Waiting until a disaster strikes is NOT a solution. That’s where the good folks at Survival Dispatch can help. A small group of responsible survival experts – people who live, eat and breathe survival preparedness, have banded together to share decades of prepping knowledge with you. So, you can have confidence and peace of mind knowing your family will not only survive but thrive if SHTF where you live. They’ve spent years hammering on gear, field-testing and honing their survival skills and strategies. They know what works and what information, is just plain B.S. Each month they bring you a full-length report, jam packed with actionable information on a different survival topic. There’s no fluff or filler – just the facts you need all laid out in plain language, so you can quickly prepare for any disaster with confidence. 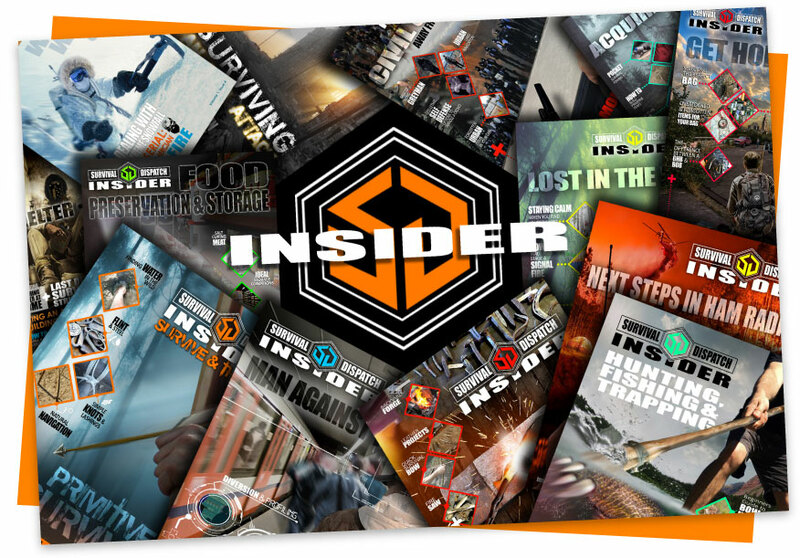 In August’s edition of the Insider for example, they discuss the topic of ‘Food Collection’ in detail. You’ll learn all about different ways to collect food in a grid down, survival situation, including several passive food collection strategies that can save valuable time and energy. On page 4, you’ll learn about how to trap fish with a weir. On page 17, you’ll learn how to build a ‘pocket fishing kit’ out of simple materials you can use to catch fish with easily. 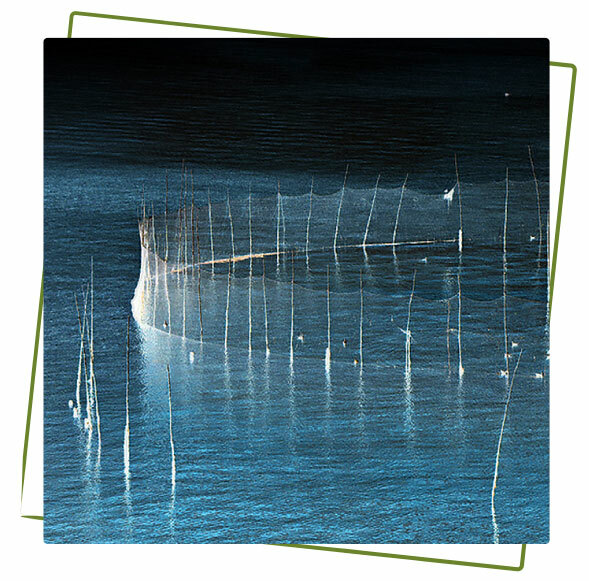 On page 32, you’ll learn how to build an ‘atlatl’ which can help enhance your spear fishing accuracy by a factor of 10, ensuring you always have a good supply of fish protein. 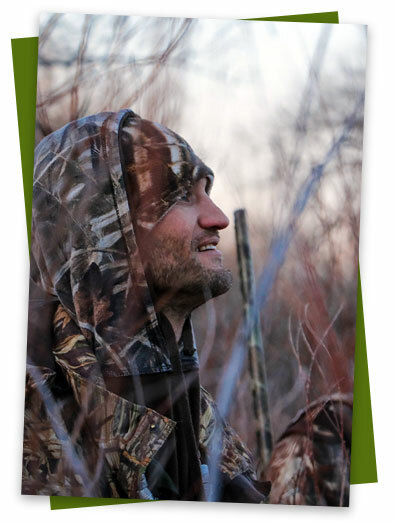 And on page 43, you’ll learn about skills you can acquire to help improve your odds of hunting successfully at night. These are just a few of the many topics covered in this one fully-illustrated, 75-page report. On page 33, you’ll learn about different food options to add to your ‘Get Home Bag’ how to select the right ones for and how much food and water you should consider carrying. 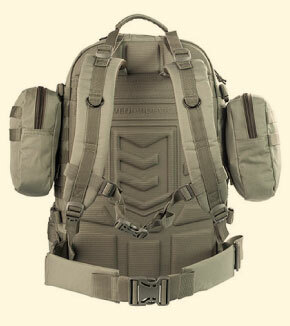 They also included a section on important yet commonly-overlooked gear that you should consider carrying and why. PLUS, there’s gear reviews to help you make smart decisions about your equipment based on their experience in the field. With a monthly membership to the Survival Dispatch Insider, you’ll have instant access to all the previous month’s issues along with new ones covering even more exciting topics. Print them off, save them in a binder to use as a handy desktop reference while you’re working on your preps. 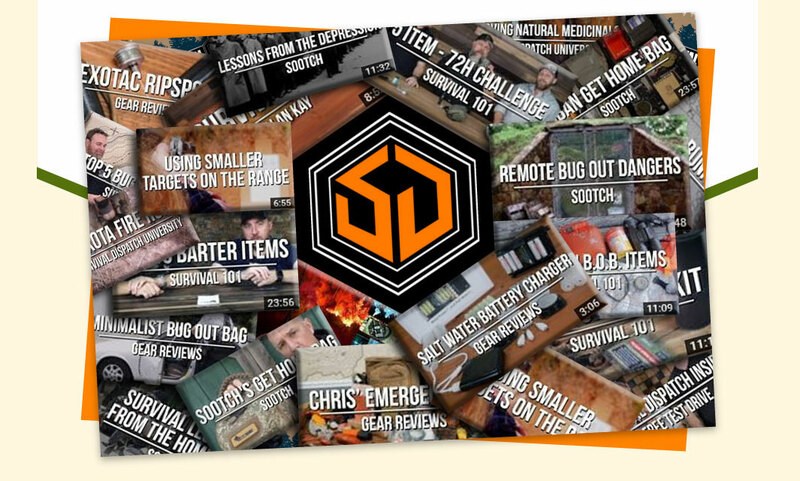 You also get access to their growing collection of ‘how to’ survival videos covering a wide variety of topics. 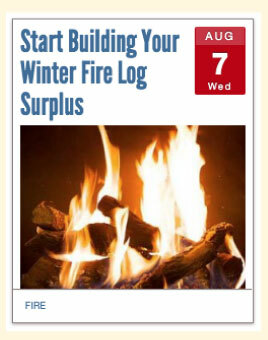 You’ll learn how to build an emergency fire, construct shelters, collect food, make water safe for drinking and dozens of other useful skills. Currently, there are more than 100 videos in SDI’s online survival library and they’re adding new ones every week. 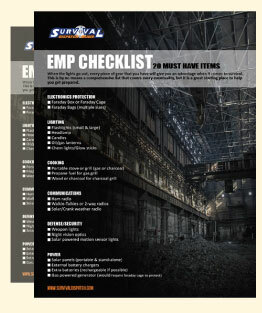 This online course covers 15 different gear categories and provides you with a plan for building out your own customized BOB, so you and your family can ‘get out of Dodge’ with all the gear you need to survive, if SHTF. Featuring in-depth and unbiased reviews of survival products these experts have personally field tested, hammered on and abused, so you make gear choices based on the real-world experience. We’re talking about gear they literally trust with their lives. And you can be confident if they say something works, it damn well does. Downloadable, printable checklist designed to keep you focused and on-track, so you could rapidly build out your preps without missing anything important. Simple monthly reminders to help you increase your supplies, maintain your gear and make changes to your preps, so you always have the right equipment and supplies in your survival bags and kits no matter what time of year it is. 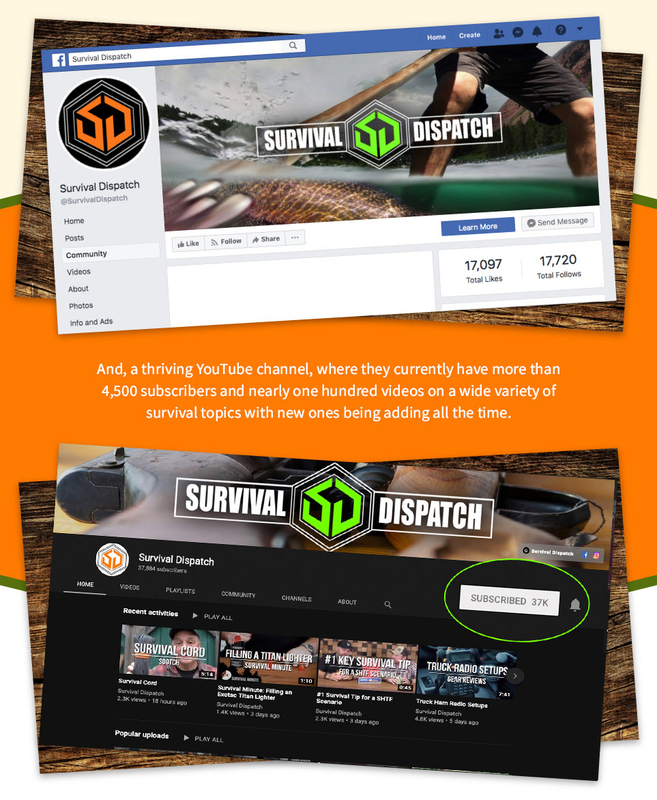 They’ve also got a thriving private Facebook Fan Page (more than 17,000 followers) where both veterans and novice preppers can swap stories and share their own prepping tips and experience with you. It took years of hard knocks, failures and brutal battle-testing to bring you all this content. 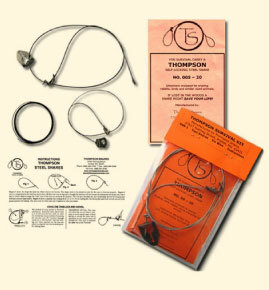 Without it, you could spend month’s trying to put together your own practical survival plan. 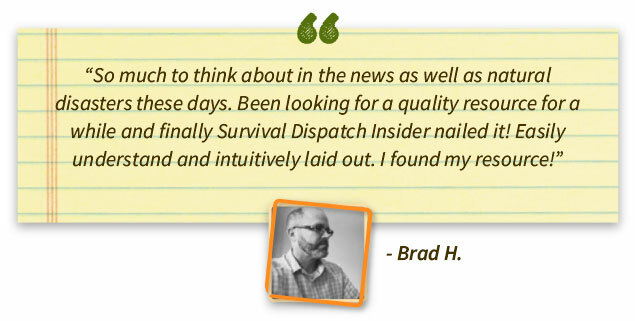 With the Survival Dispatch Insider, you get all the information you need in one place, so there’s no need to spend days or weeks searching online or spend hundreds of dollars on gear that doesn’t perform. They’ve put together a team of experts who each bring their unique skills and knowledge to the table. 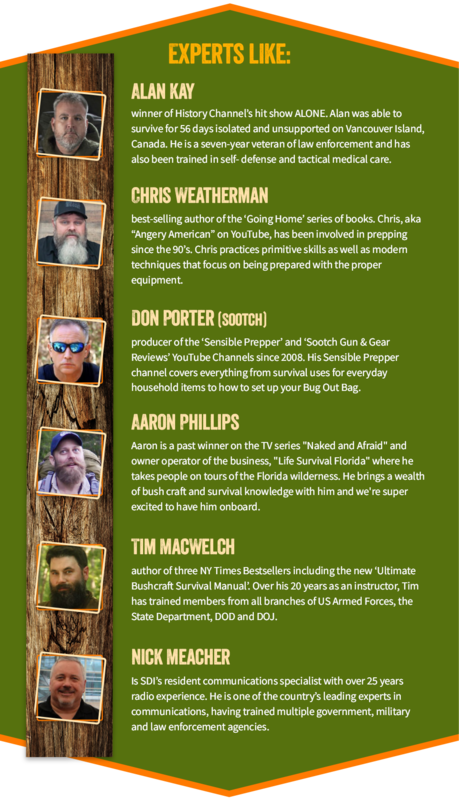 These guys are the ‘real deal’ and they want to share all their survival knowledge with you. So, if everything goes to ‘hell’ you’ll have confidence in your ability to ensure your family thrives when everyone else is trying desperately to cope in a world gone mad. All the information is broken down into byte sized chunks, so you can learn at your own pace without feeling overwhelmed. And in a very short time you could become a survival preparedness expert. These guys are no different than you or I – just regular folks who believe that their family’s safety and survival is their responsibility. If you’re still reading this, you no doubt share their belief. Now, you’re probably wondering how much they charge for membership. They could charge $37 or more a month and it would still be a great bargain, considering everything you get. It won’t cost you anywhere near that amount. 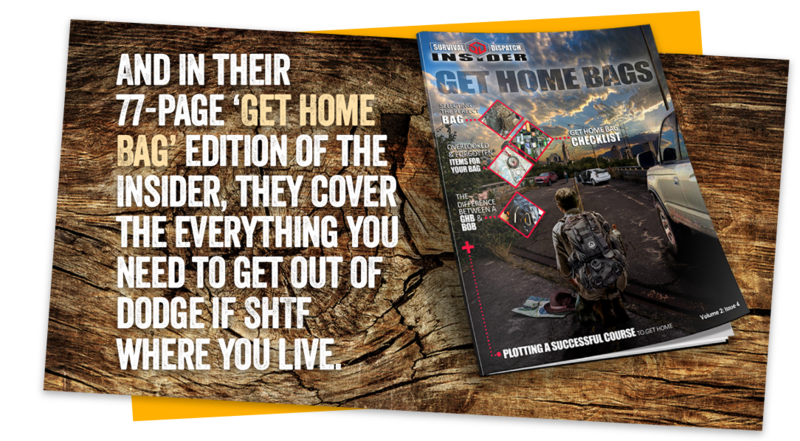 In fact, if you sign up today, it’s 100% FREE to get exclusive access to all our survival content for two full weeks. Take 14 days to look it over before you decide. Then, if you enjoy what they have to offer and want to stay on, pay just $9.95 a month. That’s less than .50 cents a day for expert advice on how to create a foolproof survival plan for your family. PLUS, your monthly membership rate will NEVER increase, even if they raise it for new members in the future. In a world fill with chaos and uncertainty, your family’s safety and survival, is YOUR responsibility. Waiting to do something until the ‘eleventh hour’ is not a solution. And hundreds of dollars spent buying gear that won’t stand up to the litmus test of real-world survival living. 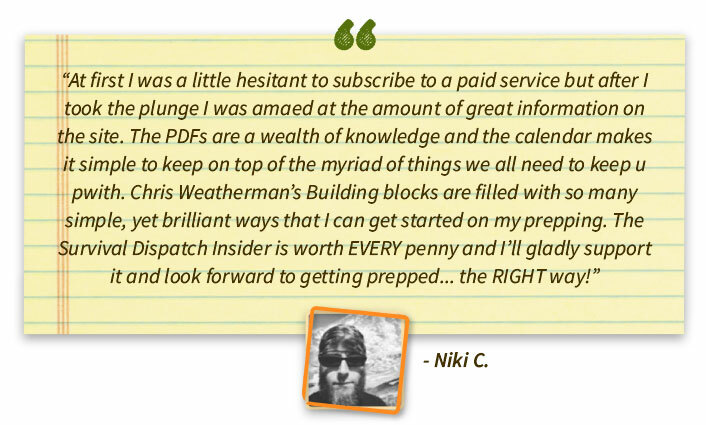 For a few cents a day you can get access to decades of survival knowledge and get your own preps up to speed quickly. Put your wallet away and click on the big button below to start your FREE 14-day TRIAL now. 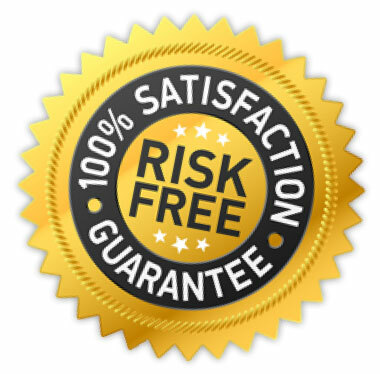 PS: Just think…For less than .50 cents a day you get instant access to decades of field-tested and proven survival knowledge…information you can start using immediately to create a foolproof survival plan to protect your family during and after a disaster strikes. It won’t cost you a penny to get started. Start your FREE 14-day trial now.